So, today's post is completely practical. Completely practical. My checkbook case is falling apart. It should be. It's, maybe, 10 years old. And plastic. I need a new one, but I H.A.T.E. going to the bank. And I can't seem to remember to ask my husband to pick a new one up for me. What's that?! I had a thought. Why not? A friend of mine gifted a hefty supply of oilcloth and laminated cotton to me last weekend. Perfect materials for meeting my needs! Do you know oilcloth? It sounds disgusting, right? But, aside from making apparel, it can do just about anything you might dream up! Home decor, upholstery, practical projects (like mine)... anything, really. Here's what I did. Keep in mind, I try to do things in as few steps as possible to keep it simple! 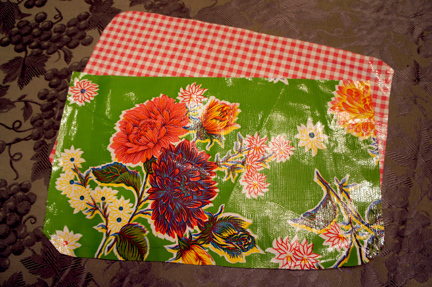 Cut one piece of oilcloth 13.75" x 6.875". 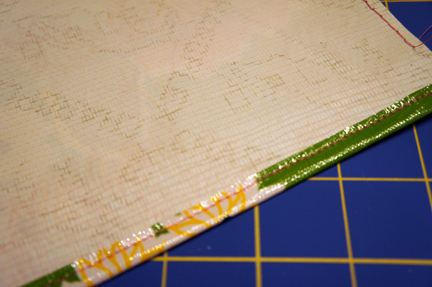 *Optional* - cut 2 strips of a coordinating fabric 2.5" x 7.875" to add a buffer for carbon copy checks. I added these to mine, but this isn't necessary if you do not carry carbon checks. 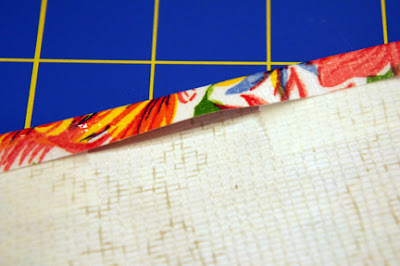 Turn the short ends under approximately .25" and hem with a basic straight stitch to finish the edge. 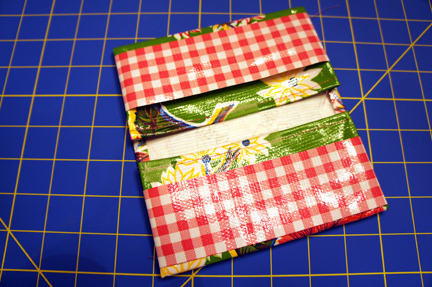 Another cool thing about oilcloth is that your creases can serve as sewing guides without having to pin your seams! And, one more exciting feature -- it doesn't fray! So easy to work with. I basted my strips into place. *Lesson Learned! * Your strip should have enough "give" to accommodate your checks. I made mine a bit too short and had to revise accordingly. 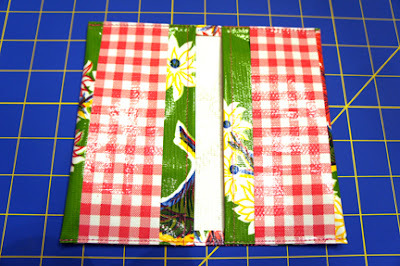 Fold the long edges under .25" and hold in place with tape. I used scotch tape, but anything will do. It is a temporary solution to holding the edges in place while you sew. 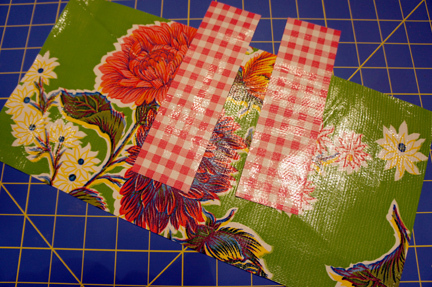 You'll want to minimize your pin holes with oilcloth. Then, fold the short edges toward the inside of your cover approximately 2.75" to make your pockets. Hold in place with tape. Sew a seam along the outer edge of the cover to hold your pockets in place. 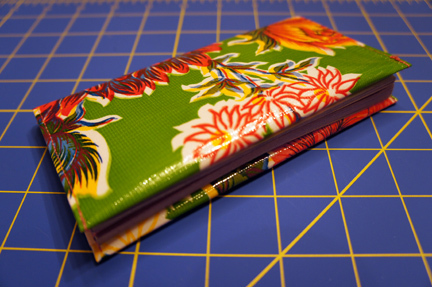 You will want to sew your seam as close to the edge as possible to allow room for your checkbook to slide in. And for you! 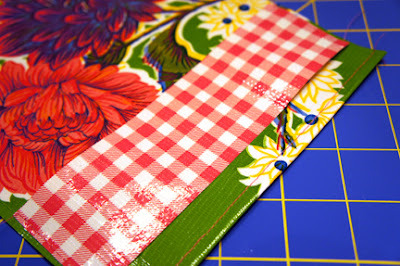 I will send the oilcloth supplies needed to make your own checkbook cover to the first 3 people who comment on this post! That will save you the time needed to cut out your pieces! Love, peace, and happiness until the next post! !